Answer: Overspending during the holidays can be a problem for anyone, and even the most budget-conscious individuals may find themselves stretched thin come January. While the situation can be stressful, there are many ways to recover from the holiday spending frenzy. The first thing you need to do is make a list of all outstanding debts. Calculate how much you need to pay off by the next billing cycle, and then review your monthly budget to find places you can cut. Can you shave $50 from your grocery expenses, or $20 from your transportation costs? Even if your budget is tight, finding small pockets of money can make a difference, especially if it means you’re not using that money to pay back interest. Take the list of outstanding debt and note the annual percentage rate (APR) for each. Credit card APR typically ranges from 11-25 percent, so it’s important to prioritize paying off the ones with the highest APR first, sometimes even if the balance is smaller. Though the balance is the same on the second and third cards, prioritize paying card No. 2 off first because it will accrue the most in interest each month. After that, pay off card No. 1 because it has a lower balance (the interest payment is the same as card No. 3). 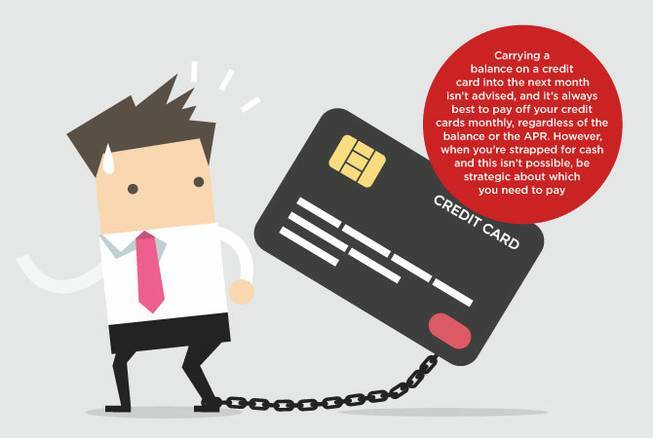 Note: Carrying a balance on a credit card into the next month isn’t advised, and it’s always best to pay off your credit cards monthly, regardless of the balance or the APR. However, when you’re strapped for cash and this isn’t possible, be strategic about which you need to pay first. When used wisely, your tax return can become a powerful tool for getting your financial situation sorted out. As of press time, the IRS had not yet announced the start date for the 2018 filing season, but it often begins mid-to-late January, so keep an eye on it and plan to file as early as possible. Typically, the sooner you file, the sooner you’ll receive your refund — the IRS reports that they issue 9 out of 10 refunds within 21 days of filing. When coping with post-holiday debt, it’s best not to wait until April. If your debt load is relatively small and can be paid off with the money from your refund — great! Plan to use it for that purpose and enjoy starting the year debt-free. However, if you’re like the other millions of Americans who struggle underneath a heavy credit card debt load, and/or if you don’t think you’ll ever be able to pay your debts in full, there is another option. Consider using the cash from your refund to hire a debt-relief attorney who can help advise you on the best ways to handle your debt. If you’re unable to pay your credit card bills, there are a few legal options that can help minimize or even nullify your debt, including debt consolidation, bankruptcy and debt settlement. The best option varies depending on the person and his or her specific financial situation, but generally, debt settlement is most preferred because it allows individuals to pay their debt for less than what they actually owe, while avoiding bankruptcy. Oftentimes, debt settlement allows someone to pay off their debt for 20-40 percent of the original balance, saving them 60-80 percent. Using your tax refund to hire a debt-settlement lawyer can greatly maximize the value, rather than being stuck paying the debt dollar-for-dollar.